Acer just announced the Predator Triton 700 at the Next@Acer press event in New York today. While many laptops meant for gaming tend to be bulky, the Predator Triton 700 is thin, measuring only 18.9 mm. It is only slightly thicker than the Razer Blade (18 mm) with which Acer seems to be looking to compete. According to Associate Marketing Manager Steven Funcke, in benchmark testing, the Triton 700 beat the Razer Blade with a 3DMark score of 17,000 to 11,139. In fact, for notebooks under 20 mm, no other laptop could come close, with second place only scoring 12,423. The Predator even outperformed thicker systems with the Schenker XMG P507 PRO (29 mm) coming closest with a score of 16,383. The design team was able to achieve this high, yet “conservative” benchmark by cramming Nvidia’s latest GTX 10-series graphics cards into the chassis, backed by up to 32GB of DDR4 RAM and driven by a seventh generation Intel Kaby Lake Processor. It also has dual PCIe solid state drives. The company did not reveal precisely what configuration the Nvidia graphics would entail, but for comparison, the Predator 21X uses dual GTX 1080 SLI cards. Acer CEO Jason Chen also seemed excited to point out that the Triton uses overclocked components. Of course, the biggest problem with all this power is heat. Funcke explained that Acer has also improved its AeroBlade fan technology. The Triton's dual AeroBlade 3D fans now push 35 percent more air through the system. This improvement is a 10 percent increase over the AeroBlades in the 21X. 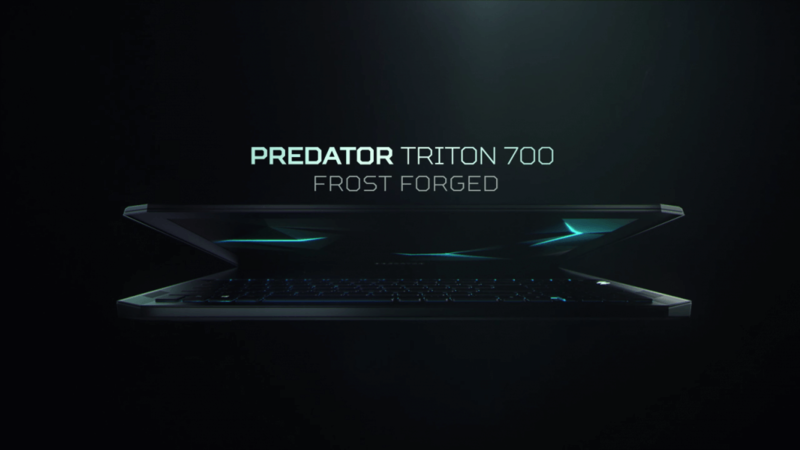 The Predator Triton 700 has a 1080p display and an LED-illuminated mechanical keyboard. However, one of the more interesting aspects of the Triton’s design is the layout of the keyboard and trackpad. Acer has switched the positions of the components so that the trackpad is above the keyboard. This redesign seems risky in that many people rest their hand while using the trackpad and in this case, the keyboard is in the way. However, since the notebook is intended for gaming, most users will probably be using a gaming mouse like the Razer Lancehead instead of the trackpad, so it will likely not pose a problem. The trackpad is also integrated into a Corning Gorilla Glass panel that shows off the internals nicely. It is an artistic touch used in the Predator 21X and made unique with the addition of the touchpad. Acer was not forthcoming with pricing. However, we should expect a price point between $3,000-4,000 based on competitive pricing models. The Predator Triton 700 should ship sometime this summer near the "back-to-school cycle."